Without any kind of Medicaid expansion, roughly 70,000 Utahns would be too poor to qualify for subsidies on the federal health insurance exchange, and yet would not qualify for Medicaid. We have all been concerned about filling this significant “coverage gap” in our social safety net. Meanwhile, under the Affordable Care Act, Utahns have been paying hundreds of millions of dollars in federal taxes that leave the state to pay for Medicaid expansion in other states. We feel the pain without any of the benefit. That is why for years I have fought to expand Medicaid in Utah in a way that addresses the coverage gap through a Medicaid program that is financially sustainable. In this post I hope to reduce some of the understandable anxiety associated with modifications to Proposition 3. I think that by talking through some of the technical complexity associated with Medicaid, the Affordable Care Act, and the legislation that is working its way through the Utah legislature (SB 96) that you will appreciate how the modifications under consideration significantly improve on Proposition 3. The Utah legislature is finalizing legislation that improves upon the voter approved expansion of Medicaid in a bill known as SB 96. Their work through these challenging issues has been characterized (and mischaracterized) in a variety of ways. Voters said that they want quality health care coverage for the roughly 150,000 Utahns potential enrollees who are below 138 percent of the federal poverty level. This bill provides that. Voters said that they want that coverage without delay. This bill provides that. And this bill provides all of this in a fiscally sustainable way, with enhancements that will improve health outcomes for recipients. Moreover, SB96 will allow the State of Utah to preserve other vitally important social programs for this very same population, like assistance in housing, nutrition and jobs — the other important “social determinants of health” that are critical for the long term well-being of the most vulnerable among us. As in Proposition 3, everyone below the federal poverty level who has not previously been eligible for federal health care coverage now will be eligible to receive full Medicaid coverage beginning April 1. That means about 70,000 Utahns who don’t have health coverage today will be eligible for health coverage in 51 days. It’s about time! For those whose incomes are in the 100-138 percent of the federal poverty level: they will keep the coverage that they are currently eligible for through the federal exchanges. Their premiums will be capped at no more than 2.08 percent of their income (about $21-28 per month for an individual), and many of them will continue to receive additional support through other subsidies. For example, consider a 21 year old single woman without dependents living in Salt Lake County. If this woman had near-poverty earnings, she could access a plan on the exchange today with zero deductibles, a monthly premium of $3.57 and $10 copays for generic drugs and primary care doctor visits. If this woman had earnings near 138 percent of the federal poverty level, her monthly premium would be less than $30, again with no deductible and $10 copays for generic drugs and primary care doctor visits. (For a helpful understanding of what is available through the federal exchange, please see this chart from our Department of Insurance). People living between 100 and 138 percent of the federal poverty level (FPL) in Utah can enroll in healthcare plans through the University of Utah, Select Health, and Molina Healthcare, with premiums capped at no more than 2.08 percent of their income. So what is the difference between SB 96 and Proposition 3? Perhaps the biggest difference is the way in which individuals are covered. 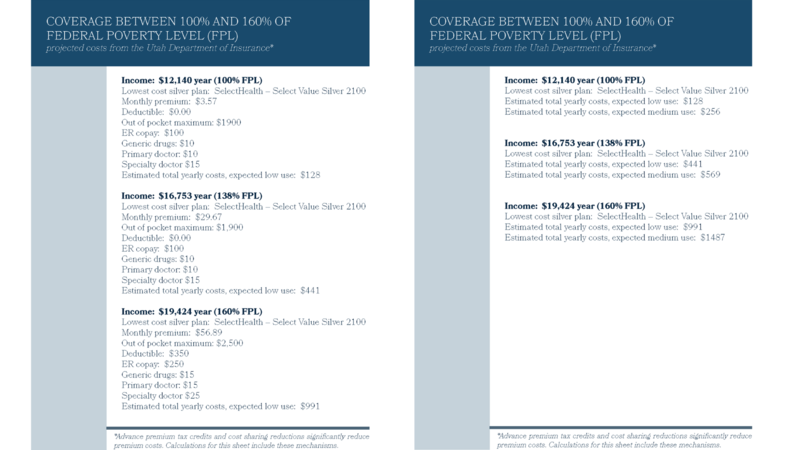 Instead of expanding Medicaid eligibility to everyone below 138 percent of the federal poverty level, SB 96 keeps those between 100 and 138 percent of the FPL with their current subsidized health insurance on healthcare.gov, the federal exchange, while expanding Medicaid eligibility to everyone below 100 percent of the federal poverty level. So why not expand Medicaid to those between 100 and 138 percent of FPL? Because, these individuals already have access to quality, subsidized health care coverage on the federal exchanges at little cost to them, and at no cost to the state of Utah. Because the federal government would continue to cover the full costs for this population, Utah can protect its general fund to support other important social services. Across the country the per-person cost of expanding Medicaid has exceeded projections by 76 percent, enrollment has nearly doubled original estimates, and predictions about the total cost missed the mark by 157 percent. We want to minimize the state’s exposure to these costs while maintaining quality care for this population, and encouraging their participation in the federal health care exchange, healthcare.gov, accomplishes this. To do this without delaying the expansion of Medicaid coverage to those in the coverage gap, the state will indeed be paying 30 percent of the costs of Medicaid expansion while we seek important flexibilities or waivers from the U.S. Department of Health and Human Services. But if the federal government grants Utah the flexibilities we are seeking, Utah would then pay only 10 percent of the costs associated with Medicaid expansion. And we can afford to do this. I am willing to use some of the surplus we have in Medicaid funds right now to build a bridge that allows us to explore getting cost-saving flexibilities from the federal government known as waivers. The bridge program and one-time funding appropriated in SB 96 will more than repay itself exponentially over time. It will create a program that is viable and financially sustainable into the future; while the expansion drafted under Proposition 3 would eventually become unaffordable. For example, in Fiscal Year 2025, it is projected that Proposition 3 costs will outstrip revenue collections by $83 million, putting pressure on other core government functions and social programs. Conversely, in Fiscal Year 2025, SB 96 will yield a surplus of $45 million. Deficits crowd out funding for other vital social programs and education. Surpluses allow us to invest meaningfully into those programs. In other words, the state will be better off by $128 million under SB 96 in that single fiscal year alone. 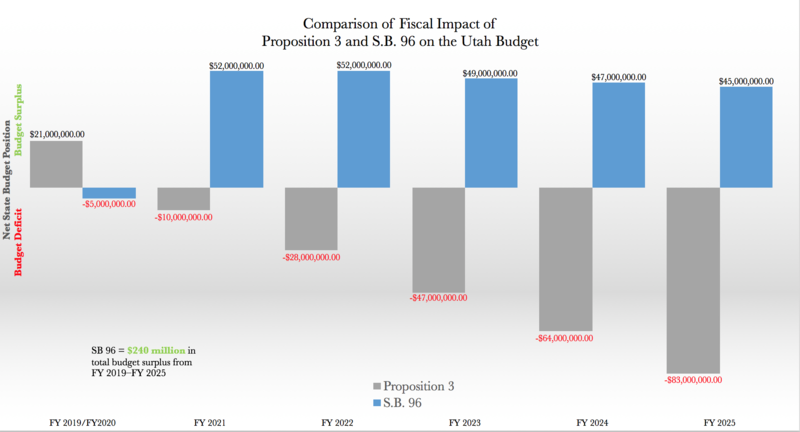 ﻿The above chart summarizes the fiscal impact of Proposition 3 and SB 96 (third substitution) on the State of Utah’s budget. While the legislature has now moved onto the fourth substitution of SB 96, the positive trend will hold. And consider this: what we are asking for is not just a more flexible, innovative program that will sustain the well-being of the most vulnerable Utahns. The Medicaid expansion program that Utah is proposing could well become a model for Medicaid expansion throughout the nation. Why? Because it will simultaneously give states the certainty that they need in budgeting, the federal government the certainty it needs in budgeting, and the incentives for providers to discover greater cost-reducing innovations in health care generally. It is not unrealistic to suggest that this kind of program could save billions of dollars nationally. That is why I am willing to expand coverage to 100 percent of the federal poverty level on April 1 with a more expensive 70 percent federal/30 percent state split, in order to keep open the option to save hundreds of millions of dollars over the long run in perpetuity. I know as well as anyone that obtaining the flexibility we need from the federal government is not a sure thing. My own previous efforts on behalf of Utah have met with mixed results. But I am very encouraged by the recent conversations that we have had with the Department of Health and Human Services that they understand the mutual benefit of providing states with greater flexibility in how they extend health care coverage under the Affordable Care Act. And if we find that we cannot get the needed flexibilities through waivers, then SB 96 will expand Medicaid up to 138 percent of the federal poverty level with fiscal guardrails in place. I do not accept the characterization that SB 96 takes away health care. It expands Medicaid to everyone under the federal poverty level and keeps in place the quality subsidized coverage for those between 100 and 138 percent of the federal poverty level. I do not accept the characterization that SB 96 ignores the will of the people. I see this as a thoughtful effort to implement the will of the people to care for the poor with quality health care with the added benefit that it can be sustained over the long term with no reduction in other important social services. SB 96 balances Utah’s compassion and Utah’s frugality. It provides quality coverage to the same population covered by Proposition 3 in a meaningful, humane and sustainable way. It is now time to set aside differences and move forward to get those in greatest need enrolled on Medicaid and on the federal health care exchanges.